Johanna Casey Burke was born in Ireland in 1807 and came to America with her husband Francis N. Burke sometime before 1860, when they lived in Elgin, Illinois with their five sons. In 1866, the Burkes lived in Chicago at the corner of 22nd Street and Kankakee Avenue (now 111 E. Cermak Road at Indiana Avenue). Francis Burke died the following year and was buried at Calvary Cemetery in Evanston, Illinois. In 1870, Johanna was living in Kankakee, Illinois with her sons William and James. By 1880, Mrs. Burke lived in Joliet, Illinois with her son Maurice, a Catholic Priest. She died in 1896 and is buried with her husband at Calvary Cemetery. 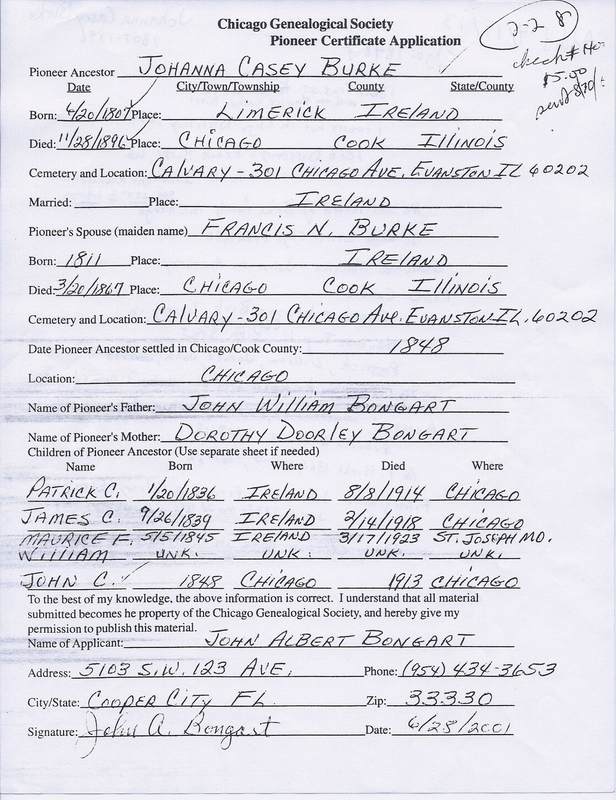 For further details, contact the Chicago Genealogical Society. Johanna Casey Burke is Pioneer Ancestor number 228.